ToppGene Suite would not be possible without the efforts and contributions to the scientific community of the following institutions. EMBL is at the forefront of innovation in life sciences research, technology development and transfer, and provides outstanding training and services to the scientific community in its member states. This publicly-funded non-profit institute is housed at five sites in Europe whose expertise covers the whole spectrum of molecular biology. Human Phenotype Ontology is a controlled vocabulary of terms - an ontology - for 8,000 abnormalities commonly associated with human monogenic diseases, and manually annotated entries in the Online Mendelian Inheritance in Man database with these terms, providing a community resource for cross-disease phenotypic comparisons. MGI-Mouse Genome Informatics. Mouse Informatics from Jackson Laboratories. GeneSigDB is a searchable database of fully traceable, standardized, annotated gene signatures which have been manually curated from publications that are indexed in PubMed. miRTarBase has accumulated more than three thousand miRNA-target interactions (MTIs), which are collected by manually surveying pertinent literature after data mining of the text systematically to filter research articles related to functional studies of miRNAs. Generally, the collected MTIs are validated experimentally by reporter assay, western blot, or microarray experiments with overexpression or knockdown of miRNAs. miRTarBase currently curates 4,270 experimentally verified MTIs between 669 miRNAs and 2,533 target genes among 14 species. While containing the largest amount of validated MTIs, the miRTarBase provides the most updated collection by comparing with other similar, previously developed databases. A PITA site denotes a single microRNA binding site prediction on a given UTR (and has a ΔΔG value). There can be (and in many cases are) many sites for the same microRNA along a given UTR. The target score represents the overall effect of all those sites combined together on the given UTR. If a microRNA has a single site on the UTR then the target score is equal to that site's ΔΔG. However, if more than one site exists for a given microRNA on a given UTR then the target score appropriately sums up the ΔΔG energies of all those sites. BIND is a database designed to store full descriptions of interactions, molecular complexes and pathways. This database is also used for obtaining protein-protein interactions. HPRD is an expert curated database containing interaction networks, disease associations, and post-translation modifications for each protein in the human proteome. This database is also used for obtaining protein-protein interactions. BioGRID is a freely accessible database of protein and genetic interactions. Comparative Toxicogenomics Database (CTD) is a community-supported public resource. It is being developed at the Mount Desert Island Biological Laboratory (MDIBL), a Marine and Freshwater Biomedical Science (MFBS) Center of the National Institutes of Environmental Health Sciences (NIEHS). KEGG PATHWAY is a collection of manually drawn pathway maps representing our knowledge on the molecular interaction and reaction networks. 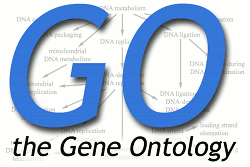 BioCyc is a collection of Pathway/Genome Databases describing the genome and the metabolic pathways. ToppGene Suite uses the HumanCyc database which is a collection of human metabolic pathways and the genes associated with each one of them. SMPDB (The Small Molecule Pathway Database) is an interactive, visual database containing more than 350 small molecule pathways found in humans. More than 2/3 of these pathways (>280) are not found in any other pathway database. The PANTHER (Protein ANalysis THrough Evolutionary Relationships) Classification System is a unique resource that classifies genes by their functions, using published scientific experimental evidence and evolutionary relationships to predict function even in the absence of direct experimental evidence. Proteins are classified by expert biologists into families and subfamilies of shared function, which are then categorized by molecular function and biological process ontology terms. Reactome is a curated resource of core pathways and reactions in human biology. The information in this database is cross-referenced with PubMed, GO, and the sequence databases at NCBI, Ensembl and UniProt. An EBI database of proteins cross-referenced to multiple databases such as family and domain databases. TargetScan database stores predicted regulatory targets of mammalian microRNAs. Targets are predicted using TargetScanS algorithm by searching for the presence of conserved 8mer and 7mer sites that match the seed region of each miRNA. PicTar is an algorithm and database for predicted miRNA targets. The Molecular Signatures Database (MSigDB) is a collection of gene sets for use with GSEA software. MSigDB data are used in several ToppGene Suite features. The Genome Browser provides a wealth of genomic information presented in the form of graphical images and links to external internet sites.